On June 1, 1967, the Beatles released Sgt. Pepper’s Lonely Hearts Club Band, an album that irrevocably changed music, art, and culture. On the fiftieth anniversary of that date, the DHC celebrates Sgt. Pepper’s golden anniversary with a special event featuring scholarly lectures and live performances. 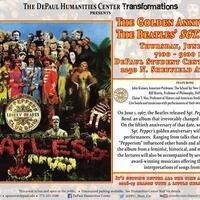 Ranging from talks that cover the way in which “Pepperism” influenced other bands and albums, to the meaning of the album from a feminist, historical, and musicological perspective, the lectures will also be accompanied by several live performances of award-winning musicians offering their contemporary interpretations of songs from the album. It’s getting better all the time as the DHC closes its 2016-17 season with a little help from our friends!